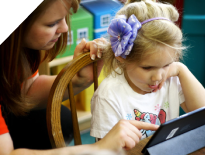 The Early Childhood Education program at Belmont College prepares students to work with children from birth through age 8. Early childhood educators support the growth and development of children in a variety of early learning settings that include: preschools, center-based and home-based child care programs, Head Start, infant and toddler learning environments, and public/private school settings. Students will graduate prepared to effectively work with co-workers, families and the community. Teachers play an important role in the lives of children and their families. Join this challenging and rewarding field as an educator, advocate, and leader in the present and future success of children! Describe sequences, stages, and milestones of children’s growth and development, social, emotional, and cognitive domains and recognize variations of typical and atypical developmental characteristics of young children, from pre-natal periods through the age of 8. Preliminary understanding of historical and contemporary theories and research, to include psychoanalytic, behaviorist, Piagetian, Vygotskyian, and information processing models, on the characteristics and needs of children from birth through age 8, to include aspects of physical, cognitive, social, emotional, language, and aesthetic domains, play, activity, learning process, and motivation to learn. Candidates recognize that developmental domains are interrelated and provide examples of interrelationships among developmental domains. Recognize and articulate multiple influences on children’s development and learning which include the diverse cultural, economic, and linguistic contexts for development, ecological contexts (home, community, support systems, etc.) child’s health status, and disabilities, individual developmental variations and learning styles, and opportunities to play and learn. Demonstrate familiarity with well known interventions programs such as The Perry Pre-School Project, Chicago Parent-Child Program, and Head Start. Cite current research about the influence of early intervention programs on child outcomes. Describe the essentials of developmental research and the principles used as a basis for creating effective learning environments. Acknowledge and value the central role of relationships and efficacy in the promotion of learning. Recognize elements of preliminary early childhood learning environments and opportunities to learn that are healthy, respectful, and supportive.